Impy is about to begin middle school which is scary enough, but Impy has been homeschooled her entire life and doesn't know what to expect. Her parents work at the local Renaissance Faire which is where Impy spends all her free time. She is thrilled when the queen gives Impy her first real role as a squire for the upcoming season. Things continue to look up when she is befriended by a group of girls at school who are popular and nice. But another girl from school who comes to the Faire each weekend warns Impy to be careful around her new friends and the warning seems founded as the group begins to tease Impy about her clothes and her attempts to fit in. An all too realistic portrayal of the problems with finding yourself in middle school. Impy starts off well but soon falls prey to the cliques and the desire to fit in where you betray who you really are. What's nicely done about this story (as opposed to many other books about the woes of middle school conformity) is that when Impy messes up, she faces very stiff consequences that are not easily resolved. She is held accountable for her actions even though we can understand what led her here in the first place. My main quibble with the book is the opening which drops the reader right into the Renaissance world without letting you know it is the Faire, not an actual setting in the middle ages. That will turn off some teen readers who will struggle with the language right off the bat. 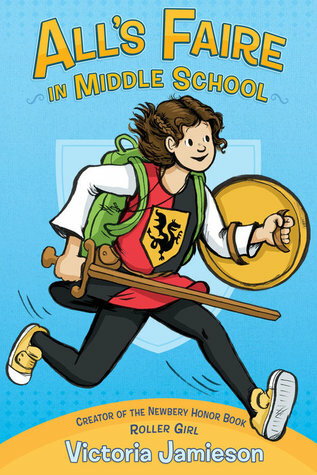 But once you get past that and onto the "quest" of conquering middle school, this will fly off my shelves.